“Come to Seal Beach. No meters on Main Street,” District One Councilman Joe Kalmick quipped at the City of Seal Beach’s latest strategic planning workshop last week. His half-serious marketing pitch was met with laughter by fellow council members and city staff at the March 13 meeting, but promoting Seal Beach to visitors is actually serious business to him and other city leaders. “With approximately two million plus visitors a year visiting our city, this is a major revenue component,” Kalmick wrote in an email to the Sun. “I think in these economic times it is important for our city to get our name out there as a great place to visit, shop, dine and relax,” District Three Councilman Mike Varipapa wrote in an email to the Sun. “Having more visitors to our City, especially in the off-season, benefits everyone,” added Mayor Thomas Moore. Now it’s part of a new long-term goal in the City’s Strategic Plan: Improve economic development in the city, while balancing the quality of life. 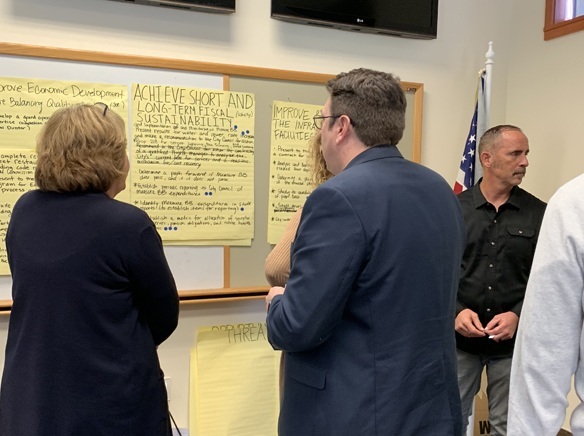 The goal, one of five identified by city leaders at the workshop, ties in to their community vision for Seal Beach as a “destination hub” with a preserved small-town Main Street. The other four goals focus on the city’s fiscal sustainability, including the impact of an upcoming one-percent sales tax increase; public safety; city staffing and infrastructure maintenance. The city has held planning workshops roughly every six months since 2016. The meetings, which are open to the public, allow council members and city staff to interact in an informal setting to determine goals and to set objectives supportive of those goals to be completed within six months. The objectives are prioritized by council members and city staff. City staff then work to implement the plan and often provide updates on the progress at council meetings. (You can find the City of Seal Beach Strategic Plan on the main page of the City’s website under “Quick Links”). Last Wednesday’s workshop at Fire Station 48 was attended by four of the five council members (District Five Councilwoman Sandra Massa-Lavitt was absent due to an illness), City Manager Jill Ingram, the city’s entire executive staff, Interim Police Chief Joe Miller and others. 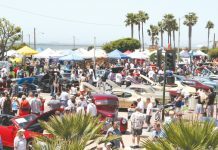 Promoting Seal Beach is central to a new objective adopted by the city which is to create a promotion or event to “advertise completion of the Pier repair project.” The objective is under the new goal on economic development. Repairs on the pier started in September. It’s expected to reopen by Memorial Day weekend, according to City Engineer, David Spitz. At the workshop, Assistant City Manager Patrick Gallegos said promoting the pier’s reopening could bring foot traffic to local businesses. “That’s a good opportunity to bring people here, not only to our pier, to enjoy the view and our pier, but also to try our food, to purchase things at our shops,” he said. Mayor Moore suggested producing a pamphlet to promote the pier’s reopening. Councilman Varipapa suggested reaching out to Westways magazine, a publication of the American Automobile Association, and local television shows for coverage. 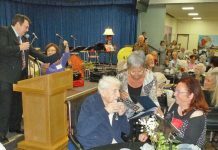 Many pointed to the Seal Beach Chamber of Commerce as a group that already helps in the marketing effort and could possibly do more. City Manager Ingram noted how the Chamber and some merchants don’t always have the same vision for how to spur economic development. “But I think there’s an opportunity there by noting it. Something for us to continue to work on,” she said. Ingram said she meets with the Chamber monthly. While Old Town shops, restaurants and the beach attract visitors, the Shops at Rossmoor are actually a bigger source of revenue for the city. The shopping center on Seal Beach Boulevard delivers double the annual revenue of Main Street, according to the city’s finance director, Vikki Beatley. Another pier-related objective identified at the meeting is to create a plan to hold public workshops on whether to put a restaurant on the Seal Beach Pier. Ruby’s Diner was a fixture at the end of the pier for 25 years until it closed in 2013 amid a dispute over lease negotiations with the city. In 2016, a fire destroyed the vacant restaurant building and caused significant damage to the pier. The pier is being repaired and rebuilt so it will be strong enough to support a building but there are no plans to construct one in the current project. Another goal of the city is to achieve short and long-term fiscal sustainability. The goal has a new dynamic since voters approved Measure BB last November to raise the city’s sales tax from 7.75 percent to 8.75 percent. The one-percent sales tax increase takes effect April 1 and could generate an additional $4.7 million in annual revenue, according to a recent estimate from Beatley. At the workshop, Beatley cautioned council members and city staff to be “very, very mindful” of choices being made with the new revenue source. “It’s not something like, ‘Woo-hoo! We got all this money coming in now let’s do everything we want to do.’ That’s not the perspective at all,” Beatley said. During the election, Measure BB was promoted as a way to boost public safety. Beatley said the budget allocates Measure BB money for five new officers at a cost of $850,000 a year. Beatley and City Manager Ingram alluded to using some Measure BB funds to fill vacant staff positions. Some of the vacancies include the positions of community development director, executive assistant to the city manager, and executive assistant to the police chief. “Staff will work strategically to fill positions that will ensure we meet the mission and vision established by the Council while being mindful of our budgetary limitations,” Gallegos wrote in an email. Another objective could alter the hours City Hall is open to the public. City staff will look at creating a uniform schedule where staff works ten hours a day, four days a week. 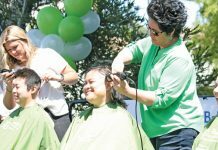 “City Hall would be closed every other Friday and to offset the hours closed, City Hall would remain open during lunch which would mean that there is one additional hour of access for the public,” Gallegos wrote in an email message. The way the measure was packaged to us was for more police officers, not for executive assistants or other city personnel.